How Long Should I Wait Between Oil Changes? As a car owner, you know that maintenance or automotive repair needs to be done periodically to keep your vehicle running smoothly. One of those maintenance requirements that stand out is oil changes. You may start thinking about having an oil change when your car hits 3000 miles or every three months, but think again! It used to be that oil changes were recommended at this point, but not anymore. Under normal driving conditions, you can now drive most cars 5000-7500 miles and sometimes 10,000 miles before changing your oil. Some models can even go 15,000 miles or more if using synthetic oil. You may be wondering why this change has taken place. Today’s motor oil is more advanced than in the past and sludge doesn’t build up as fast because oil additives don’t deplete as quickly. Engines have changed for the better, run more smoothly and pollutants from tailpipes are cleaner. It’s a waste of your money if you have your brain still programmed on the 3000-mile mark! The more oil you change, the more times you need to get rid of it, so is worse for the environment. 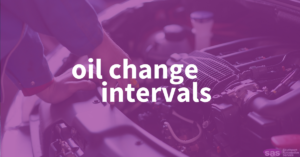 There may be some exceptions to the longer times between oil changes such as a lot of stop and go driving; pulling heavy trailers or motorhomes; driving on dusty or muddy roads; driving constantly in hot weather, etc. Looking at your car owner’s manual is the best way to find out. Oil changes differ with various makes and models of cars, even with the new standard recommended. If it’s still difficult to get that 3,000-mile oil change out of your head, a good way to remember is every time you rotate your tires, have your oil changed at the same time. For additional help with oil changes and other automotive repairs, contact us today to schedule your next appointment! We have been in business since 1981 and have a trustworthy team of highly trained technicians to assist you with all of your vehicle needs!